Newport during the holiday season is like no other. From the Illuminated Boat Parade to the Bowen's Wharf Tree Lighting, there are endless ways to celebrate the most wonderful time of year. The magic of the holiday season comes to life inside Newport's majestic mansions. Each year, The Breakers, The Elms, and Marble House open their doors to offer the public an especially glittering glimpse of the luxurious life for which they’re known. Here’s a peek at what lovers of all things merry and bright can expect to find. From thousands of poinsettias and 30 themed Christmas trees to candlelight windows and period-set holiday tables, Christmastime at the Newport Mansions is the season personified. Highlights include a 15-foot tall poinsettia tree and impressive model train set at The Breakers; a ballroom-turned-Gilded Age streetscape at The Elms; and a mantelpiece-decorating competition at Marble House. There are also plenty of new trees that will be displayed throughout the mansions. All of the mansions are open daily for tours every day between now and Tuesday, January 1st. A special guest will join the celebration -- the robust jolly one himself -- at The Breakers on December 2nd, Marble House on December 9th and The Elms on December 16th. And while the sun may set early this time of year, the Newport Mansions will be keeping their lights on for you every Saturday night. Holiday Evenings at the Newport Mansions are created to resemble the ambiance of an evening soirée during the Gilded Age. They feature live entertainment, cookies, eggnog and cider -- all set against a breathtaking backdrop of golden era elegance. If you enjoy dazzling displays of lights, Newport does not disappoint. The celebration of lights begins with the Illuminated Boat Show on Friday, November 23rd. Boats pull into the harbor decorated with colorful lights and are judged according to the best display. The excitement does not end there. The annual Bowen's Wharf Tree lighting ceremony is on Saturday, December 1st. The towering evergreen is lit at 6 pm with the help of the town's mayor. Frosty the Snowman, Mr. & Mrs. Claus and Christmas carols make the evening a memorable one. But Newport’s holiday offerings don’t end there. Head down the road to Rosecliff mansion to take in the Island Moving Company’s 17th annual performance of the Newport Nutcracker. If you've ever fantasized about stepping into the scenery of this much-loved ballet, this production -- which moves from room to room -- offers a transportive way to engage in the the performance. For the second act, guests will be seated at the table in the ballroom. 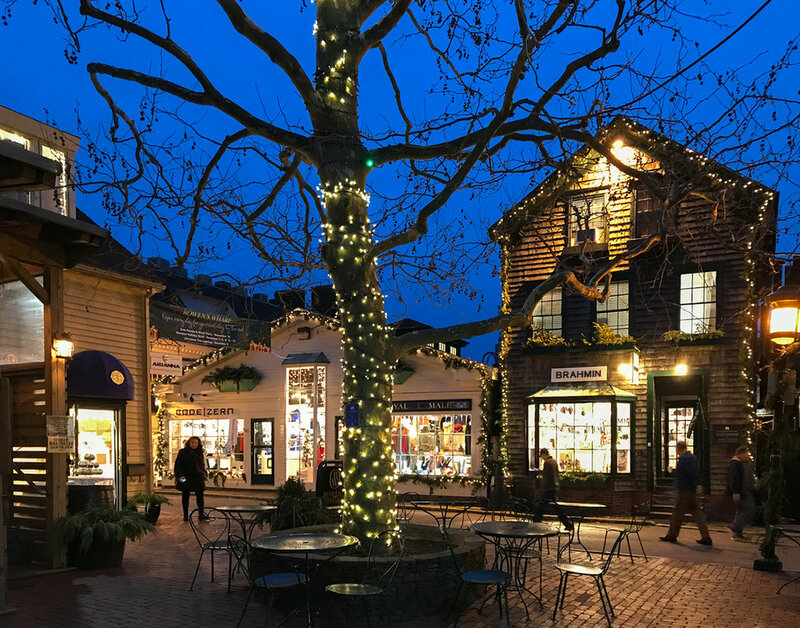 While the town of Newport glistens any season of the year, it reaches all new levels of resplendence during the holidays. If you’re ready to add some shine to your season, Christmas at the Newport Mansions is a magnificent must-do.